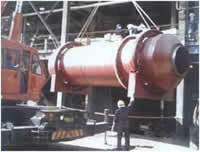 Our riggers are LMI’s (Lifting Machinery Inspectors). With a total number of 36 years of rigging experience, our clients can be assured of the highest standard of service by our company. CheckLift ensures that our experienced rigging crews consist of qualified riggers and skilled assistants. All lifting equipment is of the highest quality and standard. Registers are available on request.